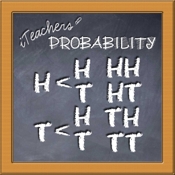 Probability is an app for students wanting to master Probability the easy way. With our International content, sharp, fast paced lessons, you will soon be top of your class. The longer you delay the further behind you could fall, it's your future at stake. Using the knowledge of a teacher who has taught for over 38 years with a Pure and Applied Mathematics Degree, you will find learning Probability a breeze, and know that your education is in the correct hands.... with a qualified Teacher. For less than a cup of coffee, you will no longer be falling behind in Mathematics. 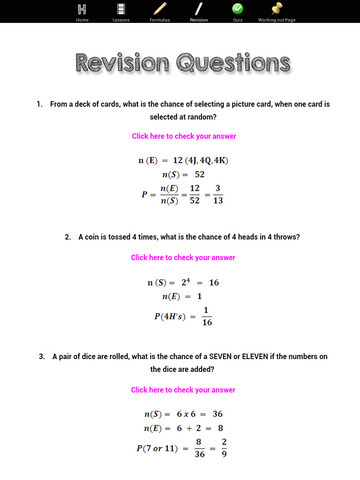 Probability has tutored lessons which shows step by step worked examples. 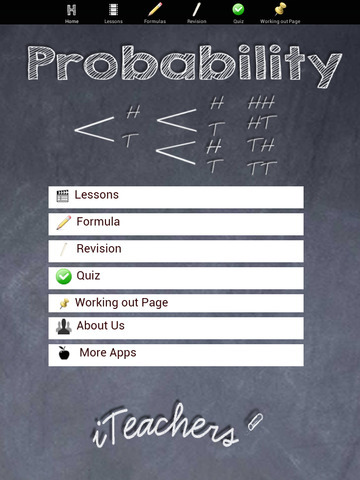 Probability Made Easy App includes; Lessons, Formulas, a Quiz and more.